Forbes recently released the 50 richest men in Malaysia and it is not difficult to be in awe and even envious of the wealth of these men. In fact, one cannot help but wish to take a leaf from these billionaires and start amassing his or her own fortune. Richest Man in Malaysia 2014: The Forbes has recently updated their list for Top 10 Richest Man in Malaysia for the Year 2014. 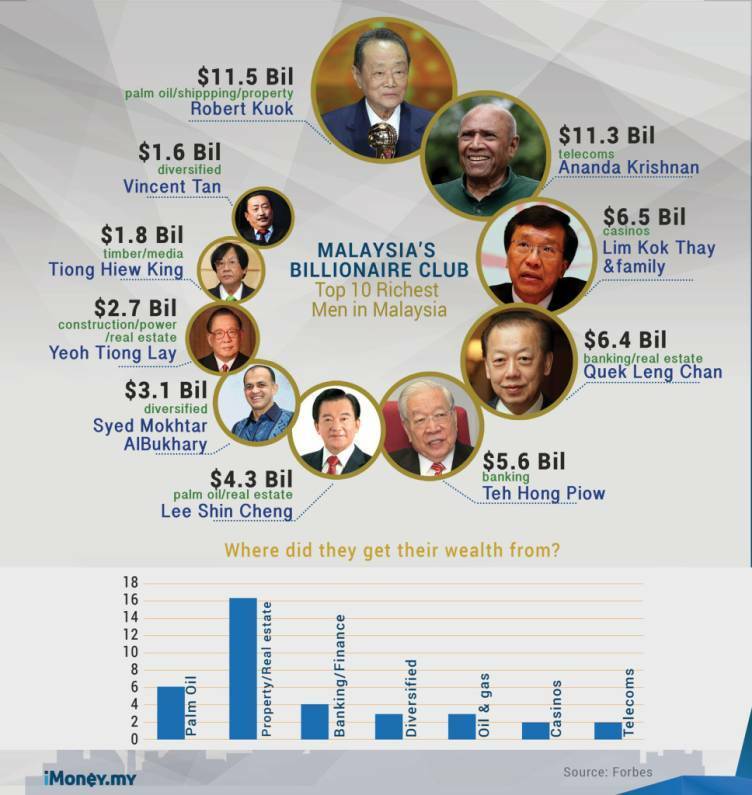 All the Top 10 Richest Man in Malaysia are Billionaires in USD. Introduction: The No. 1 richest man in Malaysia made his money in sugar, palm oil, shipping as well as property. The 89 years old Robert Kuok Hock Nien is the 64th Richest Man in the world. Introduction: Tatparanandam Ananda Krishnan is a Malaysian Indian businessman and philanthropist. Nicknamed A K, he is estimated to have a current net worth of USD 11.7 Billion according to Forbes’ latest list of wealthiest people in Malaysia. Introduction: The son of late Casino Magnate Lim Goh Tong. He is currently running Genting Berhad which is involved in leisure & hospitality, power generation, oil palm plantations, property development as well as oil & gas business activities. Introduction: Tan Sri Quek heads the Hong Leong Group Malaysia. He gets biggest part of fortune from its stake in Hong Kong listed investment company, Guoco Group. Introduction: The founder of Public Bank, the 3rd largest bank in Malaysia by assets. Public Bank has penetrated the international banking market by expanding into countries like Hong Kong, China, Cambodia and Vietnam. This entry was tagged 1Malaysia, Ananda Krishnan, casino, ecofren, ecofrenklcc, Guoco Group, Hong Leong Group Malaysia, in malaysia, kuala lumpur, Lee Shez Cheng, Lee Shin Cheng, leisure & hospitality, Lim Kok Thay, malaysia airline, Malaysia Boleh, malaysia lah, mh370, oil palm plantations, power generation, property development, Quak Lang Chan, Rimbunan Hijau, Robert Kuok, Shangri-La Hotels – Wilmar – Kerry Properties, Syed Mokhtar, Tan Sri Quek Leng Chan, Tan Sri Robert Kuok, Tan Sri Syed Mokhtar Al-Bukhary, Tan Sri Tiong Hiew King, Tan Sri Vincent Tan, Tan Sri Yeoh Tiong Lay, teh hong, Teh Hong Piow, top richest men. Bookmark the permalink.